"BENEFITS: Swivels 360 degrees in two independent planes. Allows air hose to hang straight down when used with air tools. Reduces operator fatigue. Reduces the possibility of carpal tunnel syndrome. Increases air hose life. 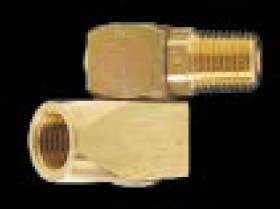 SPECIFICATIONS: Pipe size: 1/4"" NPT male x 1/4"" NPT female. MAXIMUM WORKING PRESSURE: 300 PSIG MATERIALS OF CONSTRUCTION: Body: Brass and plated steel. Seals: Buna N. "